“Digital Factory” solutions — blazing the trail for new manufacturing technologies and production concepts. Helmut Ziewers, Vice President Digital Factory Solutions | Cenit North America, Inc.
“Industry 4.0”, which some have called the “Industrial Internet” and many other terms, represent the radical change that is shaking the foundations of manufacturing. Flexible automation technology is the production process of the future, and it is building on new systems and structures. This article looks at the important contributions that “digital factory” software is making to this revolutionary change. Industry 4.0 is a new paradigm for the structure, planning, and execution of production processes through the use of modern IT and communication methods. It is yielding completely new ideas and concepts in which IT solutions are crucially blazing the trail from two main perspectives. 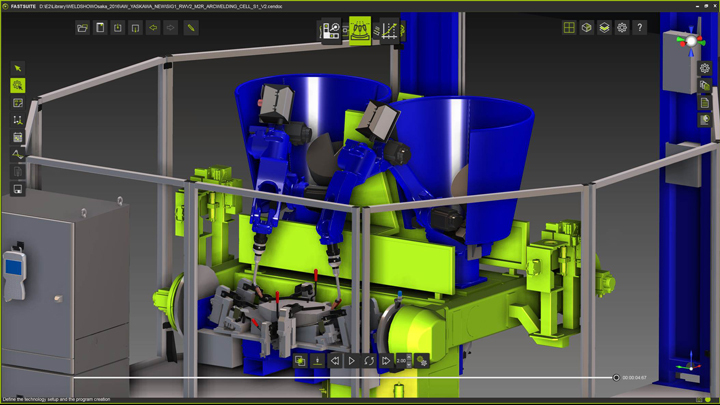 First, 3D-based simulation software allows visualization and validation of processes and production tasks. This is important, because production plants are seldom established from scratch, but are often replanned while production is running. That in itself is nothing new — appropriate solutions for the digital factory have long been in use. But what is new is this: To transform the ideas and concepts of Industry 4.0 into reality, virtual factories and model plants must now be an exact representation of the real production systems. Not just geometrically and kinematically, but also in regard to the logical behavior and control of the manufacturing units. They therefore represent a sort of virtual twin or shadow factory. This is the only way to get from stiff, prescribed processes to agile, self-organized production units. Secondly, a digital factory allows implementation of new manufacturing processes, plant concepts, and technologies that would be too expensive or even impossible without simulation-based solutions. The more robotic applications that are used — not only for simple handling tasks, but also for complex production steps — the greater the need will be for programming and simulation tools. IT solutions are leading the way to these complex applications, because they give the operator the necessary programming and simulation environment to make applications that were previously represented through a manual teach-in or would not show the necessary process quality. However, it is important to understand that a virtual copy of a plant or production line by itself does not add value to intelligent manufacturing. The production won’t be smart until all components in the virtual manufacturing process communicate with each other exactly as they will in the real environment. This network of components — the Internet of things — is the core of Industry 4.0 and opens the way to “cyber-physical” systems. Smart manufacturing brings a change from the normally rigid automation lines and robotic systems creating flexible, cooperating, agile automation solutions. It involves the transition from uncompromising tools to flexible production systems that cover a diversity of product variants, and the ability to react quickly to changing production plans. The resulting environment can even produce small batches efficiently. Do these high demands mean that intelligent manufacturing and Industry 4.0 is only for large companies? No, in fact it’s the opposite. Because the methods and ideas of Industry 4.0 are applied to smaller quantities and sub-processes, or to products with low production volume, advantages can be more clearly recognized and often more quickly implemented. The sample applications below will show how a new generation of digital manufacturing tools has become the trailblazer for progressive manufacturing technologies and future production processes. 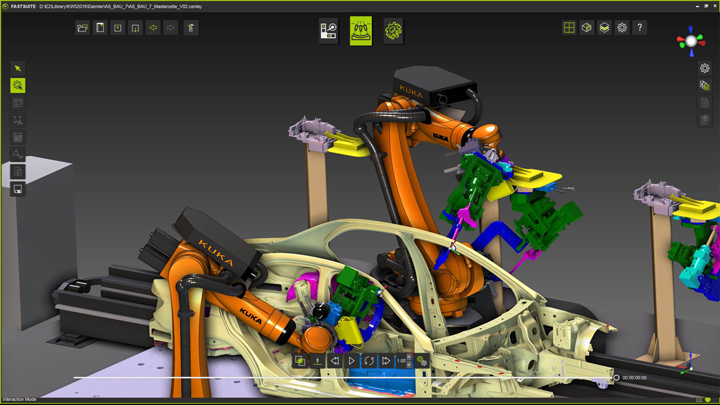 FASTSUITE Edition 2, the latest generation software, supports collaborative robots. The first question is what properties “digital factory” software must provide to help companies efficiently break into smart manufacturing. First, the software must be compatible with all CAD systems and work with any manufacturer’s robots and machines. This is a mandatory prerequisite for customer relationships that are becoming more and more diverse with more complex and demanding systems. At the same time, a program is needed that supports all relevant technologies, applications, and system designs. It must also be easily expanded when new technologies come into play. This requires an adequately generic, scalable software structure. Additionally, the software must bring along the necessary openness for harmonically integrating into existing system landscapes, data structures and customer processes. And last but not least, the project must show initial success quickly. To start with small projects and get quick, concrete results, but also to achieve a high level of expansion for automation and process integration, the “digital factory” software must be modular and scalable. It must allow setup for the specific application and grow along as the company’s needs change. On top of all the characteristics mentioned, it should also be cost-efficient and very user-friendly. A look at the everyday work of a system integrator makes it clear what benefits new-generation “digital factory” software brings to the table. In early project phases — sometimes even during the pre-sales phase — system integrators are expected to document the efficiency and functionality of their offerings with case studies, accessibility tests and feasibility studies. These tasks must be performed very quickly and with the most extensive resources possible. A digital catalog of mechatronic resources makes definition and validation of high-quality 3D layouts quick work. Also, a comprehensive range of 3D layout and simulation tools is available as well. The only question is this: Does the IT solution also ensure that the process simulation reflects the actual behavior of the manufacturing cells to be built later? Instead of building a quick layout with 3D CAD components from the catalog, and then programming the scripts and macros for simulating the material flow and behavior of the cell, it would be much easier to use mechatronic components and resources for the layout definition and at the same time to define a schematic logic for the production island. In this way, it can be ensured that the simulated and real behavior match — because the simulation is based on the same logic used during the PLC programming and therefore corresponds to the real system behavior later on. This means that no manufacturing layout is limited to standard components. Now it pays off when “digital factory” software solutions provide user-friendly functions for integrating new, project-specific components in the layout. This process must be quick and easy for users without programming knowledge to complete. At the same time, the software infrastructure of new solutions is no longer based on proprietary formats, but on open standards. Consistent use of AML (Automation Markup Language) as a descriptive language for system models, for example, allows considerably simpler interaction with engineering partners through standardized, system-neutral exchange of complete system data or equipment data, including kinematic and logic definitions. In addition, PLCOpen ensures that the system logic at the basis of the first simulation concepts can also be used for later PLC programming. The most important requirement for virtual commissioning should be supported by the software architecture. The software FASTSUITE Edition 2, which is CENITs next generation product, for example, uses a shared memory in which the controls write the simulation data and from which the 3D visualization then reads the simulation data. The Digital Factory relies on demanding solutions for collaborative Robots. This shared memory approach also allows control emulators to replace real control components during the acceptance phase. In such cases, we refer to a virtual production start, or virtual commissioning. This is possible because the entire layout consists of cyber-physical simulation models or mechatronic resources, providing the virtual link to software in the loop or hardware in the loop. This allows the virtual model to be tested against the real controls before the real system is put into operation. Virtual commissioning supports parallel workflows and reduces risks, errors and downtimes in production. It’s no surprise that demand is getting stronger all the time among automotive manufacturers. It is also a mandatory prerequisite for integration of new production processes with robot safety, cooperating robots, etc., for which realistic reproduction of ever more complex, self-organizing behavior through macro programming and scripts is no longer possible. As soon as the production islands have been started, the same virtual layout can be used to introduce new parts and products. The time-consuming teach-in and the production interruptions that go with it are no longer needed. The advantage of a high-performance digital factory is not just limited to offline programming of a robot cell while the real cells are operating. Development of modern robotic technologies and applications bring the advantage of 3D solutions for offline programming and simulations even more into play. This is because the complex 3D movements now in demand can no longer be taught manually. Production processes like roll hemming, sealing, adhesion or painting require a virtual programming and simulation environment, so that they can also be efficiently operated when small batches come through or conversion is required often. Then there is another aspect that shows the advantage of a modern “digital factory”: It is far more efficient to reuse not only the CAD data, but also the metadata provided by engineering (such as for fasteners) instead of redefining them in production every time. The advantages mentioned above are relevant to all manufacturing industries, as shown by a look at the aircraft industry. In aircraft construction, we are seeing increasing use of robot cells for manufacturing composite materials and the associated technologies, such as laying bands, placing patches and cleaning molds. For this, special, often highly complex machines and robotics systems are being used in the airframe construction departments. The aircraft industry also places stringent requirements on administration of fastener data and process automation. Here also, a virtual 3D factory solution is becoming a prerequisite for introducing automation concepts with the goal of making manual processes superfluous and achieving better production performance. Providers of the right software solutions must increasingly see themselves as project and implementation partners for the manufacturing industries, and also as bridge builders between engineering and production. There are often major system discrepancies between CAD systems on the one hand and manufacturing on the other. Software partners must help close these gaps efficiently. Aside from that: Manufacturing technologies and processes are becoming more and more complex, while system and component variants become ever more flexible. This requires software providers to offer solutions that make complex things simple and easy to control again. The growing trend toward greater flexibility in manufacturing processes through standardized machine- and robot-based applications is unstoppable. The result will be highly adaptable manufacturing processes with which batches of any size — including just one — can be produced efficiently. We know that Industry 4.0 provides us with the concepts and ideas necessary for this paradigm change. However, the transformation also forces IT system integrators and software companies to create the mechatronic systems with a 1-to-1 relationship to real production conditions. “Digital factory” solutions are therefore the core of making Industry 4.0 a reality.